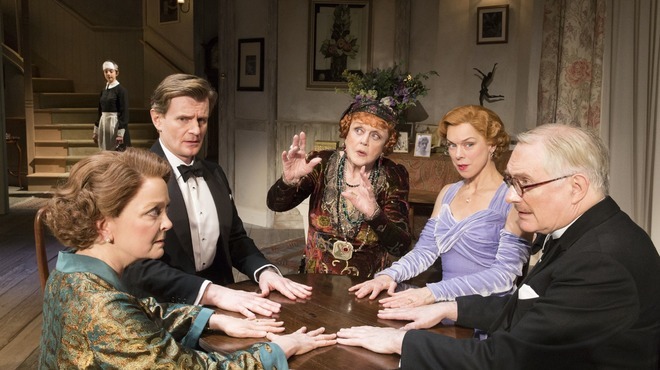 Michael Blakemore’s West End revival of Nöel Coward’s 1941 play Blithe Spirit, which brings Angela Lansbury back to the London stage after almost 40 years’ absence, is a light and fun production that makes good use of its star actor’s comic talents. Lansbury plays the medium Madame Arcati, reprising the role for which she won a Tony Award in 2009. Invited to perform a seance at the home of cynical novelist Charles Condomine, Madame Arcati’s supernatural talents prove to be more powerful than anticipated. She unwittingly summons the ghost of Charles’s mischievous dead wife Elvira, much to the consternation of his new spouse, the cool-headed Ruth, who ends up being accidentally killed by Elvira and, in turn, comes back as a vengeful poltergeist. This otherworldly love triangle throws Charles and his wives into a ridiculous and hilarious domestic crisis, throughout which Madame Arcati remains a barmy, straight-talking constant, popping up intermittently to offer assistance to the Condomines with a sketchy rate of success. Fans of Bedknobs and Broomsticks will no doubt enjoy seeing Lansbury play Madame Arcati with the same mix of bumbling charm and steely determination that made her character so endearing in the 1971 Disney film. The play’s ending, in which Charles is happy to abandon his wives to an eternity of torment provided he can be free of their nagging presence, is hopelessly misogynist on paper, but this element of the script is smoothed over by strong performances by Janie Dee and Jemima Rooper as Ruth and Elvira. For all their foibles, Charles Condomine’s wives come across as infinitely smarter, funnier and more interesting than their wet and impractical husband, whose vacillating character is played with considerable comic skill by Charles Edwards. As Mr Condomine heads off at the end of the play to start a new life of bachelor freedom, one cannot help but think that it is poor Ruth and Elvira who are finally lucky to be rid of him. Blithe Spirit runs at the Gielgud Theatre until 7 June.